Like it or not, this thing is impressive. It’s shot to look like one continuous shot, and it is greatly achieved. I was constantly watching for cuts and could rarely spot them. This speaks greatly of the director and DP, but also totally ups the acting game. The cast in this thing is phenomenal. It’s a weird movie, and probably won’t be liked by a lot of people, but I found it mesmerizing. The soundtrack is amazing and perfect. My only real criticism of the movie is that I wish it would’ve ended a little sooner than it did. There was a perfect moment for the credits to roll, in my opinion, but that didn’t happen. Still, this is one of the most unique movies I’ve seen in a long time. We saw this on Christmas Day with my folks. It was exactly what you think it will be. 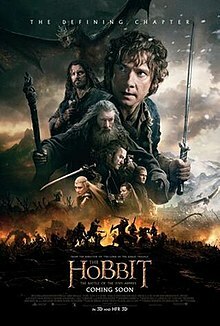 I found the Hobbit movies entertaining enough, and they were a fun to go to with family around Christmas every year, but give me The Lord of the Rings Trilogy over this any day of the week. Still a fun time.